Almudena González studied at Conservatorio Superior de Granada and Liceu de Barcelona with Julia Gallego. After she moved to Trinity College of music London where she studied under the tuition of professors Wissam Boustany, Emmer McDonough and Sue Thomas supported by the Cordelia Mosses and Trinity Trust Scholarships. She moved to Cologne to learn with professor Robert Winn, finally she moved to Barcelona and finished her studies with Vincens Prats in ESMUC. Almudena has attended masterclasses with Jacques Zoon, Juliette Hurel, János Balint, Wil Offermans, Philippe Bernold, Karen Jones, Sue Thomas, Andrea Lieberknecht, Paul Edmund Davies… She won the “Musica en Otoño” chamber music competition with her duo La inégalité in 2015, the Jury Special Award at the On Wings competition with the Sideris quintet in Holland 2011, she was awarded with the “Special Award” at the British Flute Society Young Artist Competition in 2010 and in the same year she was finalist at the Harold Clarke Woodwind Competition. She performed in venues such as the South Bank Center, English National Opera Colliseum, Teatro Pérez Galdós, Ronnie Scotts, Picasso Museum in Málaga, L’Auditori de Barcelona, Sala María Cristina Málaga, Teatro de la Comédie Clermond Ferrand or Auditorio Manuel de Falla among others. 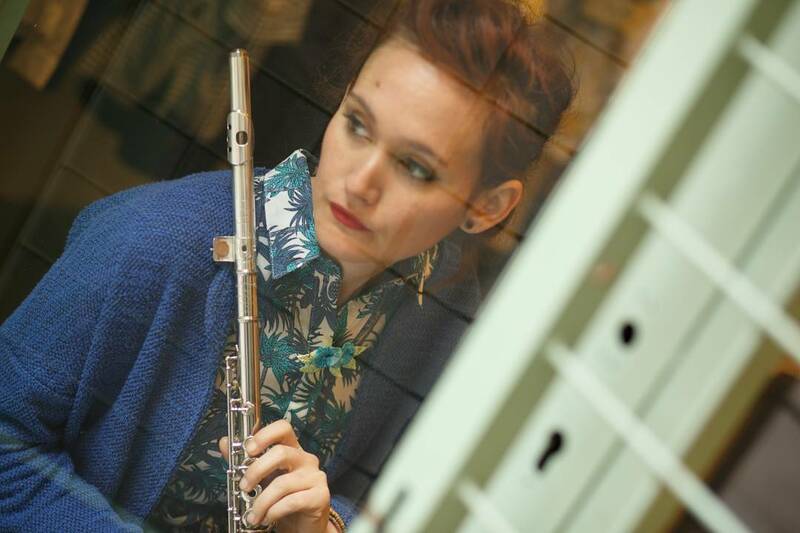 She has been invited to festivals such as Beethoven Festival in Bonn, John Cage Centennial Music Circus in London (ENO), Mixtur contemporary music in Barcelona, British Flute Society, CAMAC Harps Festival, Festival Noche de las Velas in Segovia or Time and Space at the Royal Observatory London. Almudena has collaborated in orchestras such as London Mahler Orchestra, London Youth Symphony Orchestra, Janáček Youth Philharmonic Orchestra, BCN216, ISSO – International Students Symphony Orchestra, Ensemble XXI, Academia de la Orquesta Ciudad de Granada working with artists like Stuart Bedford, ​ Edward Gardner​ , Michael Stern, Sian Edwards. At the moment her main work is with ​ Duo La inégalité wich she just recorded the album ​ A New Perspective ​ ( ​ http://www.orpheusclassical.com/​ ) and touring abroad with their new perspective on classical music. They recorded they new videoclip for MEAM (Museo Europeu d’Art Moderne). Almudena collaborated at the Pompeu Fabra University (Music and Technology department) at a researching of new apps and technologies for music. She is also a very experienced tutor, working with DigiQualia, supported by the Florence Academy of Arts, (​ www.digiqualia.com​ ) with whom she records digital master classes for promoting and teaching contemporary music.